25: IN THE BEGINNING WAS THE WORD. ISRAEL AND THE WEST BANK: view the project (to read the accompanying texts, click on each image). Or: Follow this link to read the project in pdf format. We come closer to the women who work for peace in Israel and the West Bank, by coming face to face with their demeanor, their deepest desires and their life histories. Through this we may trace a new emotional map of both the region and the conflict that is bleeding it dry. We meet some of the women responsible for not letting hope desert the Middle East region completely. 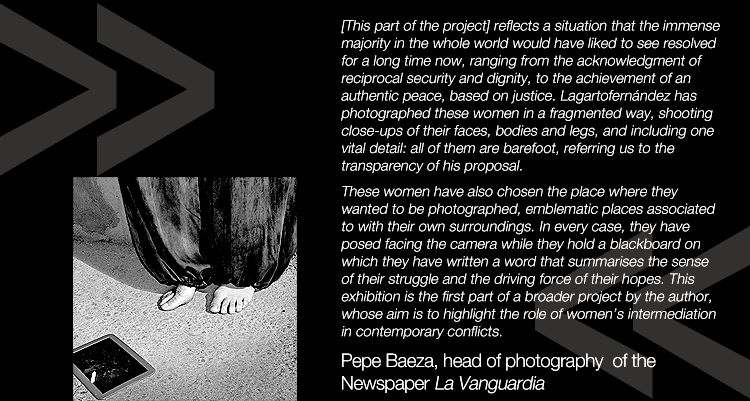 View the exhibition Barefoot Words: Women Peacemakers (Paraules Descalces: Dones fent Pau) produced by the International Catalan Institute for Peace (ICIP).